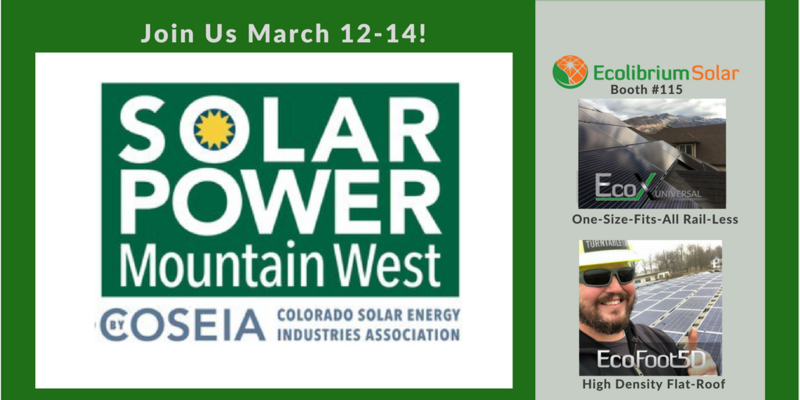 Ecolibrium Solar, Inc., the racking solution provider leading the way in solar mounting innovations, is attending Solar Power Mountain West at Hyatt Regency Denver-Aurora Conference Center in Aurora, Colorado, March 12-14. The event is the largest solar conference in the Mountain West. With a conference theme of “The Solar Connection,” speakers will focus on how solar energy is key to a clean and connected world. “We are excited to showcase innovations that maximize rooftop arrays and are much easier and faster to install,” says Sam Veague, Chief Operating Officer of Ecolibrium Solar. Ecolibrium Solar’s research and development lab is in Boulder, Colorado. The company will exhibit industry-preferred commercial and residential racking solutions, EcoFoot5D and EcoFoot2+, 5- and 10-degree ballasted systems respectively, and EcoX Universal, the No. 1 Universal Racking System in the U.S.
Visit us and learn why EcoX Rail-less Racking and EcoFoot5D and EcoFoot2+ Ballasted Racking are the mounting systems of choice for installers of commercial and residential racking.